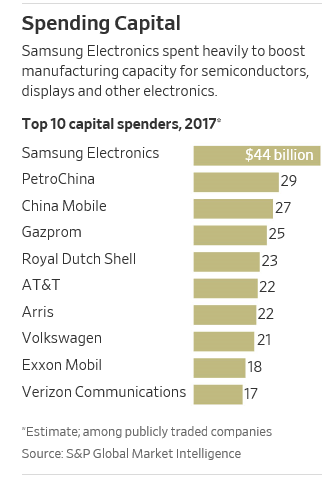 A recent article in the Wall Street Journal showed that the tech giant Samsung spent more on capital expenditures than did the two oil majors – Exxon Mobil and Royal Dutch Shell — combined (see table below). As someone who survived the tech bubble, it seems like déjà vu. This article brought to mind the late 90’s during the tech and telecom boom. At that time, Wall Street raised large chunks of capital — principally debt – to install fiber optic networks to meet the exploding internet data demand. At the same time, the mining industry attracted limited outside capital investment. The excess capital investment ultimately led to overbuilding and a glut of fiber optic network capacity. WorldCom, then one of the largest telecom companies, went bankrupt in 2002 under the burden of $41 billion of debt. Its Chairman, Bernie Ebbers, currently serves a 25-year prison term as the result of his conviction for fraud and conspiracy. During the late 90’s, miners added only modestly to capacity as investors favored the new technology industries. Then, as we moved in to a new century/millennium, emerging economies showed a growth spurt, particularly China. With their rapid expansion, these countries invested heavily in building their infrastructures. The result – demand for hard commodities exploded. With limited mining capacity to meet that demand, hard commodity prices spiked (see Figure 2 below). Miners then invested heavily in new capacity — a long-term project. History seems to be showing a modest repetition. 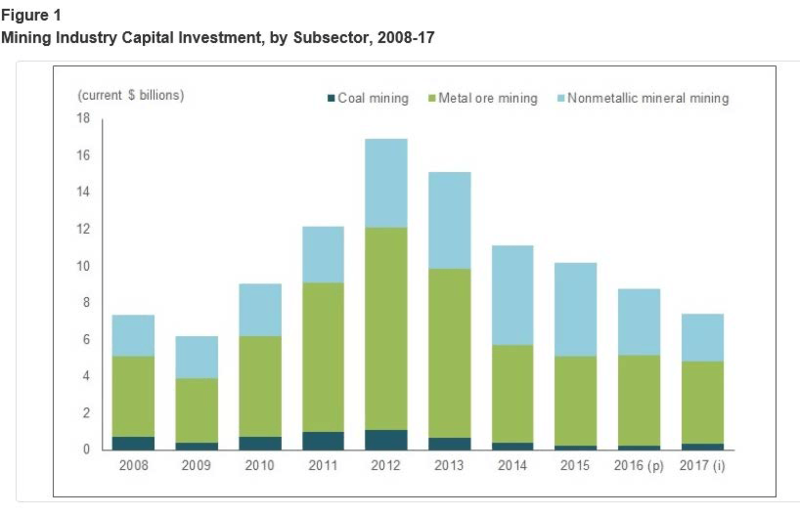 Since 2012, reflecting the slow recovery of the global economy, mining industry capital investment declined (see Figure 1). Five years later, nearly all countries show uniform economic expansion. The International Monetary Fund (IMF) this month raised its global economic growth forecasts by 0.2% to 3.9% for this year and next. Those forecasts compare to 3.7% growth last year and 3.2% in 2016. For emerging markets and developing economies, the IMF looks for economic growth of 4.9% this year and 5.0% in 2019. Those forecasts compare to 4.7% last year and 4.4% in 2016. Besides the increasing economic growth, if the dollar continues weak, this would also add to hard commodity demand and prices. This combination of events suggest some parallel with the last decade and if that parallel proves out, hard commodity demand and prices should materially benefit, in addition, if commodity prices move generally upward, that would add to increased investor expectations for higher inflation. Figure 2 illustrates the long-term movement of metals prices. The graph illustrates the commodity price spike in the first half of the last decade as well as the price decline since early in this decade. In our view, the current cyclical positions of the domestic and global economies should prove a positive for hard commodity prices. Domestically, hard commodity prices normally should benefit when the US economic cycle matures – as is likely over the next 18 months. At the same time, synchronous world economic growth should also prove a positive for commodity prices. If this proves correct, commodity stocks should positively reflect this price outlook, but typically, only for some limited period of time.